Photographs were only in pen and ink in 1868. Evidently. After an immigrant committed an act of terrorism in New South Wales, there was the expected panic across the country. In Perth, demands were made for moderate members of the terrorist’s religion to distance themselves from the act, or risk all of them being tainted with the accusation of sympathiser. Regular Dodgy Perth readers will not be surprised to discover the religion was Roman Catholicism. And the year was 1868. 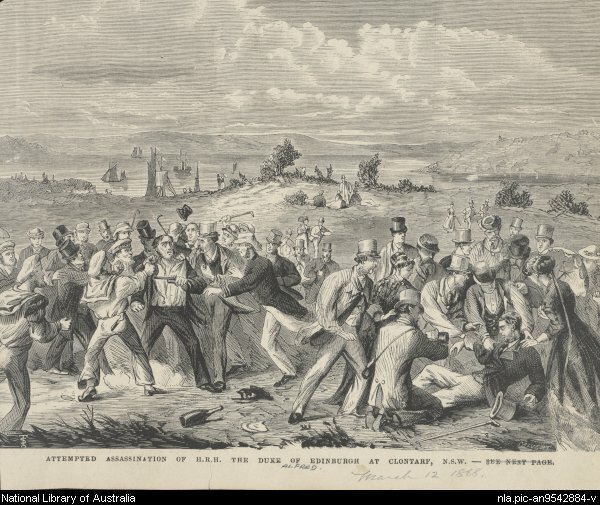 The Duke of Edinburgh, second son of Queen Vic, was on an overseas jolly when he attended a picnic at Clontarf, now an upmarket Sydney suburb, but then a popular picnicking spot. While the Duke was enjoying the picnic, an Irishman with a history of mental illness, Henry O’Farrell, fired his pistol at close range. The bullet struck the Prince’s back, glanced off his ribs, finally inflicting only a slight wound. O’Farrell was nearly lynched by the crowd, and only saved by being arrested. He didn’t have long for this world, though, and despite his evident mental illness, he was hanged at Darlinghurst Gaol. Even before this event, the 1860s had not been a good time for Catholic-Protestant relationships in the various Australian colonies. From newspapers, every non-Catholic knew all Irishmen were Fenians, thus making every Irishman a potential terrorist. Anti-Irish sentiment became rampant. New South Wales passed a law making it an offence to refuse to drink to the Queen’s health. Following the failed assassination, large public meetings were held around the country including at the Court House in Perth. The fear was palpable. A number of convicts in Western Australia had been transported for being Fenians, and everyone was terrified at the terrorists we were now harbouring. The British Government promised two military companies from Tasmania in the event of terrorism happening in Perth, and the State Government promised to use violent force to stamp out any local signs of Fenian activism. Martin Griver, the Catholic bishop of Perth, had to stand up on behalf of ‘moderate’ Catholics to pledge loyalty to Queen Vic and plead that local residents would not see all Catholics as Irish, and not all Irish as Fenians. The meeting ended with approving a letter to be sent to the Monarch expressing how very very British all Australians were really. And being good Brits they did not like shooting members of her family. What is good, though, is that it would be impossible for the citizens of Perth in 2015 to treat one violent person in Sydney as a representative of his religion and call for immigration restrictions. This could never happen today. ← Previous Post Where’s me gargoyle then?